Week 13 saw eighteen goals in the six matches. Hearts grabbing a rare away win. Motherwell faltering at home and Celtic getting back to winning ways after their Champions League midweek woes. Celtic maintained their five-point lead over Inverness with an easy win in the highlands over a stuttering Ross County side. Celtic started on the front foot in this contest and remained well on top for the duration. Their Dutch defender Virgil Van Dijk, was first to test Mark Brown after skipping away from a challenge in midfield he saw his effort from the edge of the box well saved by the former Celtic stopper. The central defender came close for the second time in as many minutes, a short corner ended up with the cross being whipped into the back post which Van Dijk met but only could head wide of Brown’s right-hand post. County’s best chance of the half came from a corner, it was floated in, Brian Maclean got above Van Dijk but could only flash his header over the top, and he really should have hit the target. The opening goal arrived just before half-time another short Celtic corner created it. Izaguirre floated a cross with his right foot on to the head of the dangerous Van Dijk – he beat his marker to nod the ball home off the inside of the post. Celtic doubled the lead shortly after the restart, firstly some hesitant Micic defending allowed Scott Brown to get in behind, Mark Brown denied him pushing his effort on to the post and out for the corner. From the resulting corner, Van Dijk met the inswinging Mulgrew set-piece as he doubled his goal tally for the day and his Celtic career. Ross County got a lifeline in the 68th minute; Rocco Quinn’s long-range effort was pushed into the path of Ivan Sproule who finished expertly past Forster. That just spurred Celtic on who scored two goals in three minutes. Joe Ledley grabbed a double through headed efforts; he also hit the post late on. Ten-man Aberdeen fell at home after leading at half-time at Pittodrie. The win leaves Hearts 12 points behind eleventh-placed Kilmarnock. Despite the Dons’ good recent form, Hearts had the best two chances early on. Hearts’ left-back Kevin McHattie found Stevenson at the back post, but the former Ayr United man shot straight at Langfield. Walker, Hearts’ tricky winger tested Langfield from long range but saw his effort easily held. The Jambos would be made regret those missed chances minutes later. Barry Robson’s corner from the left-hand side allowed McGinn to confidently finish past MacDonald. McGinn then missed from the spot, which would prove costly in the end as Aberdeen only went in one up at the break. Into the second period, the home side were down to ten as Barry Robson got his second booking for bringing down Jason Holt in the midfield area. That only gave the Hearts’ youngsters the belief they needed to get back into the game. They drew level in the 66th minute as Walker slotted home. This is no more than they deserved. The young side had their tails up and took the lead with 16 minutes left, Walker turned provider cutting the ball back for 19-year-old Paterson to fire home. As Aberdeen poured forward, they were caught on the counter when Stevenson scored the third and sealed the points in injury time. Inverness kept up their good form beating Hibs at Easter Road to stay second in the table. It took the visitors just 14 minutes to take the lead, James Collins brought down Shinnie from behind in the box, and the referee pointed to the spot. Nick Ross stepped up, and went high to give them the lead. It was only four minutes later that Caley doubled the lead. Shinnie, was again at the heart of the action setting up Billy McKay, who finished from a difficult angle, to heap more misery on for the home support. A third wasn’t too far away Doran’s cross was deflected onto his own post by Hanlon. Hibs tried to create in the second half but the chances were limited, as they didn’t find their way back into the game. Collins headed over from a Rowan Vine cross and that was as good as it got for a side low in confidence. Inverness had an appeal for a penalty, when it looked like Maybury fouled Nick Ross in the box, the referee was unmoved by the claims. Billy McKay had a late chance to add to his goal in the first half but it did not matter in the end as the visitors ran out comfortable winners. 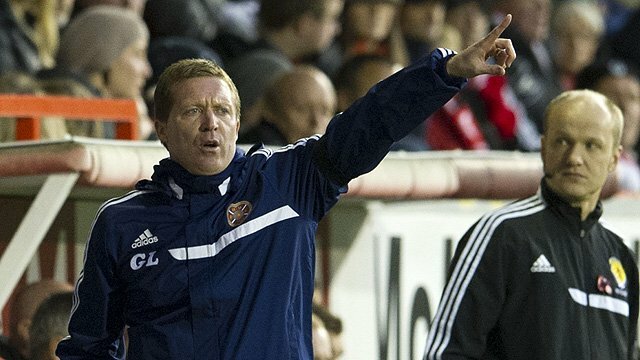 Dundee United ran riot at Fir Park, in what was a surprisingly heavy home defeat for Stuart McCall’s side. 17-year-old midfielder Ryan Gauld gave United the lead 16 minutes in when the Mothewell ‘keeper flapped at a long ball into the box before the youngster volleyed home with aplomb. Two minutes later it was two-nil to the visitors, Francis-Angol was robbed by Gauld due to his naïve defending, then Mackay-Steven crossed, and Paul Paton headed home after a relative scramble at the back for Motherwell. After some good direct play this time Armstrong and Ciftci linked up well before the striker fired narrowly wide of the right-hand post. Motherwell’s best chance was when Sutton’s low drive forced United’s Polish goalkeeper into a good save, at the other end Mackay-Steven was stopped from adding a third by Nielsen. At the start of the second period, Nielsen had to be at his acrobatic best to deny Robertson’s deflected shot, Cifcti could only put the rebound wide. The third goal arrived in the 64th minute, neat play by Armstrong and Cifcti, as the latter played Gauld through for his second as he fired low past the helpless Nielsen. Goodwille came close before he was involved in the build-up for the final goal, the ball eventually reaching Robertson who thumped home the fourth to seal an impressive away victory. St Mirren came away from Firhill with a morale-boosting victory against ten-man Thistle. Early on Thistle were almost the architects of their own downfall, some slack defending allowed Steven Thompson to set up McGowan, the attacker could only put his effort past Scott Fox’s right-hand post. Kenny McLean troubled Fox with a dipping free-kick, that the goalkeeper could only help behind for a corner. From that corner Steven Thompson headed McLean’s delivery home. Doolan’s neat turn and shot forced Saints’ goalkeeper Marian Kello into a good save as half-time loomed. Partick should have been level at the start of the second half, Kallum Higginbotham beat two players and showed some nice footwork before only shooting straight at Fox, when he should have done much better. Then the home side had claims for a handball when Higginbotham’s effort hit the arm of Jim Goodwin, before the home side were reduced to ten men as O’Donnell picked up a second yellow for a needless foul. The Saints added to their lead with 18 minutes to go, McGowan found Conor Newton with a wonderful through ball, and then the on-loan Englishman gave the pass the finish it deserved. McGinn went close, before Steven Thompson got his second of the afternoon finishing Danny Grainger’s cross to cap off a good away day for the Paisley side. St Johstone notched another impressive home win against nine-man Kilmarnock. Nigel Hasselbaink gave the hosts the lead 24 minutes in, Pascali was too late spotting the danger, and the Dutchman remained composed to slot home his fourth goal in four games. Six minutes later O’Hara failed to deal with a Gary Miller cross-field pass, and the nippy Stevie May got in behind the Killie defence to double the lead. The first half ended when Jackson Irvine was booked for diving, not the best end to the half for the visitors. Just minutes into the second half Irvine was given his marching orders, when he went in with a late tackle on Gary Miller. It got worse as Michael Gardyne tripped Millar in the box to give May a chance to get his second and St Johnstone’s third from the spot. The young striker duly obliged as he added another two goals to his impressive season so far. Clohessy got a consolation with 21 minutes to go as his cross from the right out-foxed Mannus in the St Johnstone goal, went over his head and into the net. Barr completed a miserable day for Kilmarnock as they were down to nine men when he hauled Stevie May to the ground.